The prime minister addressed 10,000 people at Yankee Stadium. Prime Minister Justin Trudeau takes part in the procession prior to delivering the commencement address to New York University graduates at Yankee Stadium in New York on May 16, 2018. NEW YORK — Prime Minister Justin Trudeau's first order of business after descending on Donald Trump's hometown Wednesday was to enlist thousands of newly minted American university graduates in the fight against a rising tide of intolerance and nationalism around the world. Officials had billed Trudeau's three-day trip to New York and Boston as focused on trade and the economic relationship between Canada and the U.S., with looming NAFTA deadlines as a backdrop. 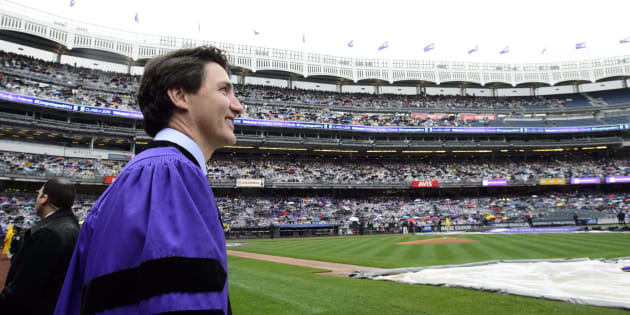 But inside the towering stone, gilt-lettered facade of Yankee Stadium, Trudeau kicked off his latest U.S. visit with an earnest commencement speech to more than 10,000 enthusiastic, cheering New York University grads, urging them to break out of their comfort zones. Respect people who don't look or think like you do, Trudeau said. Engage those with whom you may not agree. And take up a leadership role against the aggressive nationalism and identity politics that are making the world a far more complex place to live. "The leadership we need most today, and in the years to come, is leadership that brings people together," he said, clad in a graduation gown of his own after receiving an honorary degree — the first world leader to get one from NYU while in office. "That brings diversity to a common cause. This is the antithesis of the polarization, the aggressive nationalism, the identity politics that have grown so common of late." Trudeau did not mention the U.S. president or any other leaders by name in a speech that appeared to be targeting the kind of populist politics Trump represents, and was received warmly by the audience who roared loudly every time Trudeau appeared on the screen. Huddled under a sea of colourful umbrellas against a relentless rain, the audience saved its biggest cheers for any time Trudeau made mention of Canada's refugee program, his government's emphasis on human rights and the legitimacy of climate change. Seeking out people with different viewpoints and respecting those who hold different political opinions does not mean those perspectives all have merit, he noted. He mentioned advocates of female genital mutilation in the same breath as deniers of climate change — people who hold viewpoints that will never be valid, no matter how long they have been expressing those views or how loudly they do so. He urged graduates to do more than just tolerate other points of view, but to respect and hear what others say in service of a better understanding the world, rather than simply striving to win an argument. "Think about it: Saying 'I tolerate you' actually means something like, 'OK, I grudgingly admit that you have a right to exist, but just don't get up in my face about it. Or date my sister.'" "There's not a religion in the world that asks you to 'tolerate thy neighbour.'" Later Wednesday, Trudeau was scheduled to meet with several executives from major American companies, including the heads of PepsiCo., and Honeywell. On Thursday, he's scheduled to speak to the Economic Club of New York before decamping for Boston. Trudeau spoke by phone with Trump earlier this week about the North American Free Trade Agreement, a conversation in which he told the president that a deal is possible, but only if some U.S. demands are withdrawn. For more than a year, Trudeau has gone to great lengths to speak out against things Trump stands for without directly criticizing him, perhaps most notably when he tweeted about Canada welcoming refugees even as Trump was cracking down on immigration from Muslim-majority nations. Thus far, Trump has appeared to show both respect and warmth for his Canadian counterpart, referring to him at times as smart and as a friend. It will be against that backdrop next month that Trudeau hosts Trump in Canada for the first time at the G7 summit in Quebec, where the U.S. president joins six other leaders whose world views support multilateralism, immigration and environmental protection.